A dive bar should not have a web page. Their trade is in the real world, in solace, conversation, joy, camaraderie. For a dive bar to build a website, it would seem too presumptuous, too pretentious, too Yuppie. It would tempt the Fates of Gentrification and the Gods of Hipsters to come down upon them. Plus, when an old school bar has a website, it looks like your mom’s Geocities page circa 2002. 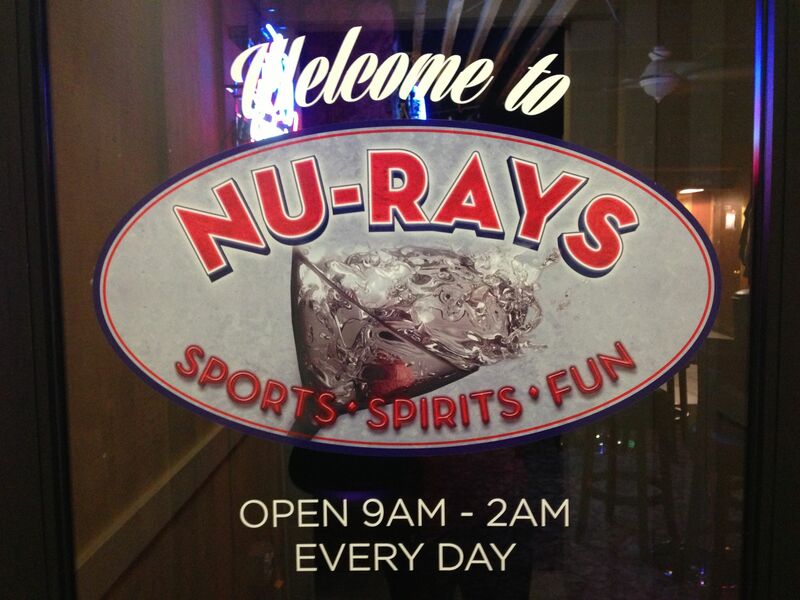 Case in point, check out the official Nu-Rays webpage. 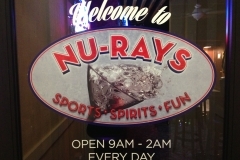 Nu-Rays is an old-school dive bar, and is a study in contrasts. The bar has been at 709 Ferry Street in Martinez for more than fifty years, yet after a remodel it still looks old. It is cool and dark in the day, and warm and vibrant at night. Opens early and closes late. TV Gameshows in the morning, live music and dancing after dark. It has cheap well drinks and top-shelf liquors. The bartenders are friendly, the regulars are friendly, but they will also leave you alone with your thoughts. These contrasts are a reflection of the neighborhood and the patrons. Judges drink next to janitors. Refinery workers talk sports with lawyers. At the bar, Millennials check Instagram, while middle-aged housewives check Facebook, while barflies check their lotto slips. Just like Martinez, Nu-Rays is a community. Local bars have always been the community watering hole, the village well. They are where neighbors meet, chat, and catch-up with one another. Like the “trivium” in Ancient Rome, the junction in the street where folks would fill buckets at the fountain, and exchange tidbits of information. What we now call trivia. Some trivia about the bar. Back in the 60s it was Oscar’s Lounge, a swanky spot with mood lighting, leather couches, and a faux fireplace. In the 90s, Ray bought it and changed the name to Ray’s. A few years ago Ray sold the bar and the name had to be changed and the liquor license updated. In a bind, and lacking imagination, the new owner wrote down Nu-Rays as the business name, and it stuck. And it suits the place. The New Ray’s got rid of the aged dated swank. No more lava lamps, couch, or faux fireplace. Absent the musty swank, Nu-Rays has its classic swagger back. Stark, dark, solid, and authentic. “No hooking, drug dealing, fighting, or barfing. These will get you 86'd." By a quirk of fate, all of the full service bars in Downtown Martinez are located along Ferry Street. This gave birth to the “Ferry Street Crawl”. A group can hit every location in a few hours, travelling north to south. Starting near the train tracks at Sunflower Garden, enjoy a beverage and get a good drinking base of noodles and fried food. Then move down to College Lane. Cross Main Street for a handcrafted drink at Barrelista, like you were in a fancy San Francisco joint. And finally, end the crawl at Nu-Rays for music and cocktails all night. THAT is the Ferry Street Crawl that most have lived to tell. What are the elements of an authentic “dive bar”? It all starts with friendly bartenders and locals, and complete lack of pretension. The people are authentic; you can be your authentic self. If you had a crap day and need a drink, if you had a success and want to toast someone to it, if you really just need an hour without the kids or chores, you can be what you need to be. And of course it is a bar, and alcohol plays a large part in its purpose. The drinks are nothing fancy: cold beer, good liquor, cheap cocktails. You can get artisanal cherrywood smoked cucumber mojitos with a sprig of thyme somewhere else. Ambiance would be a two-bit word for the authentic mood of Nu-Rays. In the morning the regulars watch The Price is Right and play Lotto. In the afternoon workers from around town sip a drink and watch some of the game on TV. At night, music is cranked up and a crowd mingles and dances and talks loudly late into the night. The vibe ebbs and flows casually, naturally. The dive bar and honky-tonk are kissing cousins. After the after-work crowd has moved on home, the social evening kicks off and Nu-Rays gets lively: rocking jukebox, live bands, dancing, karaoke, open mic night. RELAX: You might be diving to drink and have fun, or to slum it with friends. Either way, let go of pretenses. People-watching is fun, but remember you are all in this dive together. TAKE IT OUTSIDE: If you want to smoke, talk on the phone, pewk, screw, or argue, step to the curb. People have their own stuff to deal with and don’t need your noise in their lives. And blame the smoking thing on the Government. MARK YOUR TURF: When you get up, put your coaster or napkin over your drink. This marks it as “in progress” while you step away to dance, wee, or smoke. TIP: This is a JOB for the person behind the bar. They have kids and car payments and a house and bills to pay for. Tip at least a buck per drink or beer. For a called cocktail, leave the bartender two bucks. For something special or extra service, leave three on the bar. For every drink. The dive bar is as Americana as it gets, and Nu-Rays is as Martinez as it gets. It is a big bite of life and love and your community. If you wonder "Who drinks at 9am? ", or "Where can we meet after work? ", or if your mommy club needs a fun place to drink cheap, check it out. And if you forget your etiquette, at least remember the simple rules. Which really no one should have to remind you of when you are in public. Tell them Rick sent you.